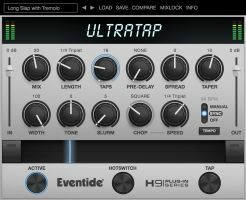 Eventide is has announced availability of UltraTap — inaugurating its H9 Plug-in Series as a unique multi-tap effects plug-in capable of rhythmic delays, glitchy reverbs, huge pad-like volume swells, and extraordinary modulation derived from its TEC Award-winning H9 Harmonizer Effects Processor. UltraTap is the perfect tool for creating drum fills, vocal choruses, swelling guitar chords, and other evolving effects — everything from reversed reverbs to a massed church choir singing Gregorian chants in Notre-Dame Cathedral. Creatively, it is also optimized for live use; UltraTap's unique HotSwitch and The Ribbon features facilitate programming any combination of the controls and seamlessly morphing from sound to sound. Says Eventide Director of Marketing Communications Nalia Sanchez: "We're finding that, increasingly, audio engineers have an H9 stompbox sitting on the console to take advantage of the nearly 50 algorithms that we've crammed into that box. In response to requests for plug-in versions of many of our H9 effects, we've decided to develop a new family of plug-ins — the H9 Plug-In Series. UltraTap comes bundled with 150 presets tailored for the needs of audio professionals and a novel feature for DJs — The Ribbon." Think of UltraTap as the mother of all Echoplexes and you won't be too far off. 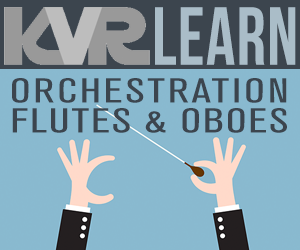 That's basically how it operates, but with the flexibility to add as many 'tape-heads' as you want and expressively control their positions and levels. Ultimately, UltraTap's unique story stretches way back to 1982 when a flexible 64-tap delay debuted as part of the Factory Program suite within Eventide's SP 2016, the world's first rack-mount programmable audio effects processor. By the late-Eighties that UltraTap algorithm had migrated to the infamous H3000 Ultra-Harmonizer... then onwards and upwards to the DSP4000 Ultra-Harmonizer and H8000 Ultra-Harmonizer high-end studio rack processors. Thanks to advances in technology, Eventide was able to then include UltraTap in a compact form factor — the H9 Harmonizer Effects Processor stompbox. So now the DAW-residing UltraTap has come full circle... bringing all that creative inspiration and superb audio quality back to the studio where it all began 35 years ago. As UltraTap is the first algorithm in the new H9 Plug-In Series to take this trailblazing journey, expect more Eventide algorithms to follow. 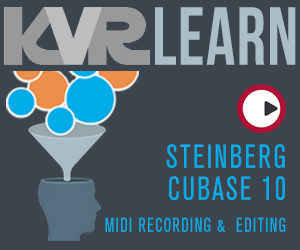 Over 150 presets designed to inspire, including artist presets by Chris Carter, Colin Newman, Sasha, and many more. Manipulate effects in realtime using The Ribbon to morph seamlessly between two settings of any combination of controls. Smear taps together or modulate them into unheard reverbs by using the innovative Slurm parameter. Speed up or slow down the rhythmic space between taps by altering the Spread knob. Use the onboard LFOs and envelopes to Chop up the sound source into tremolo'd rhythms. Modify the stereo image of taps to alternating from hard-panned to mono. 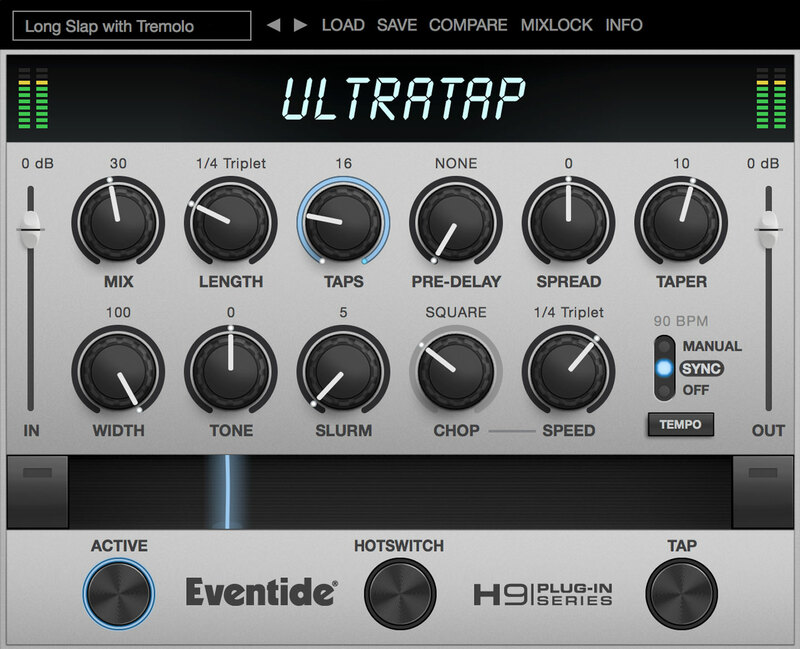 UltraTap is available now (as an AAX/AU/VST plug-in for Mac OS X 10.7+ and Windows 7+) at an introductory price of $49.00 USD (rising to an MSRP of $79.00 USD thereafter) from Eventide dealers and its website (A fully-functional 30-day demo version is available; UltraTap is also available as part of Eventide's Ensemble Subscription bundle).